You're not the only one wondering how Melinda Salisbury is my Valentine this year. In fact, I feel like I should be baking a batch of heart-shaped biscuits in the kitchen or re-writing lines of prose in a homemade card at the moment. Instead, I'm hosting the blog tour for Mel's debut, The Sin Eater's Daughter (better than cramming a box of chocolates on my own!) which was released last week. Even before publication, comparisons were made between Salisbury's new series and the likes of Throne of Glass and Shadow and Bone, and it's not disappointed! After meeting Mel at the Scholastic Bloggers' Brunch a few weeks ago, having just sent the questions, I loved that her personality shone through in the answers I received! Q) What was it that made you want to write Fantasy novels in particular? A) They're my favourite kinds of stories, so it was a natural fit for me. I'm an escapist reader - books, to me, are a passport to another place, and I want to visit places unlike anything I've ever known. Plus, a lot of my other interests fit into that fantasy box - I love medieval history, and magic, and fairytales, all things that also mesh well with fantasy worlds. I think I'd struggle to write a contemporary novel, because I'm not a very grounded person. 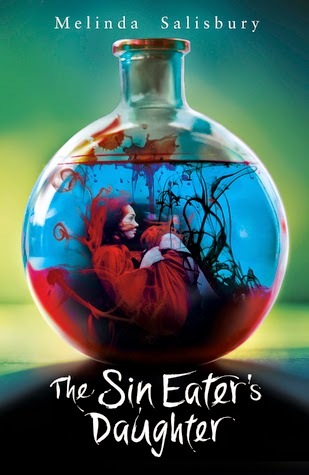 Q) What was the writing process like for The Sin Eater's Daughter? Did you have a certain writing spot or snack that helped you through? A) It was strange, because I wasn't writing it really with the intention of getting it published. Whilst I was writing it I actually had another story on submission with agents, and I started writing The Sin Eater's Daughter a chapter or two a day, just to keep myself occupied. I was sending it to my friend Liv every time I finished a chapter, and she kept asking what happened next, so I'd write another. It was only really at the end I realised I had a book, and it was way better than the one I was submitting. Luckily, the woman who became my agent agreed. I like to drink tea while I'm writing. I switch to coffee when I'm editing. I also have a thing about Cadbury Twirls. No idea why. Q) Despite being set in a fictional world, are there any aspects of your debut that were inspired by your own experiences? A) Yes - many. Twylla's struggles with the life she has have been mine, in the past. I've been in that place where you're going through the motions of doing what you're told you should do, ticking boxes and not really living. Obviously, our actual experiences are very different, but her sleepwalking through her life, shying away from confronting the problems with it have been my struggles too. I suspect there are a lot of people living the lives they think they ought to, instead of the ones they want to. I had everything you're supposed to want and it wasn't enough and it made me hate myself, just as she does. And like her, I was shaken out of it. I also travel a lot, and that's really influenced the novel. The mirror maze in the book is based on a real one I visited in Prague, the food and geography and climate is stolen from places I've visited. The world of The Sin Eater's Daughter was basically mined from my life, and honed, and made into a thing entirely of its own. Q) For The Sin Eater's Daughter, you had to imagine the entire Kingdom of Lorene. If you could explore another alternate Fantasy world for a day, which would it be? A) The wizarding world of Harry Potter. Hands down. I'd want to go to The Three Broomsticks and The Leaky Cauldron and eat Pumpkin Pasties and bow to Hippogriff and see it if bowed back. I'd like to be flummoxed by a moving staircase at Hogwarts, and watch a Quidditch match. But I wouldn't leave at the end of the day. I'd see if I could get a job as Hagrid's assistant, or a Muggle Liaison officer. Q) Multiple Young Adult novels have received a movie adaptation recently. Who would you dream cast if a film of The Sin Eater's Daughter was going to be made? A) I really don't know! Friends have asked me this, and it's really hard for me to cast people, because obviously in my head I can see exactly what all of the characters look like and they just look like themselves. I can think of some actors that resemble the images in my head, for example Aneurin Barnard in The White Queen was very close to my Merek, and Saoirse Ronan has the wistful sadness of Twylla in her looks, but I think it's something I'd rather leave to readers, or casting agents to decide on. Q) Was there a playlist that you wrote your novel to? If not, what songs would be a part of it? A) I don't write to music at all. I need silence when I'm writing, and it's not something I draw inspiration from. I get all of my outside input from travelling and nature. Having said that, I was listening to the radio in the kitchen one night on a break from editing and I heard Broken Crown by Mumford and Sons and thought, "Oh my God, that's the theme song of the book." The same thing happened when I was writing the second one, I heard London Grammar's Sights and it was the song. I'm so excited to see what song encapsulates book three. Q) So far, what has been the highlight of your publication journey? A) I know it might sound a little trite, but it's been all of the people I've met. The people I've worked with at Scholastic, my agent, other authors, bloggers, fans, booksellers. The YA scene in the UK is just so incredibly supportive and friendly and I've made so many friends along the way. Seeing a copy of the book for the first time was incredible but seeing my ne friends being just as excited, and proud, as I am is beyond amazing. That so many people are embracing my dream, and talking about it, is humbling and incredible. As a thank you, I wish I could send some Red Velvet Valentine's Day cupcakes your way! Have you picked up a copy of The Sin Eater's Daughter yet? Anticipating the rest of the series? Thank you to Rachel from Scholastic for asking me to host and Mel for answering my questions! Unfortunately it has yet to be released here, but I'm SO looking forward to it. Around the Red Queen, and Fairest, and A Darker Shade of Magic, this one won out as my most anticipated read of the beginning of the year. I'm counting the days until release.